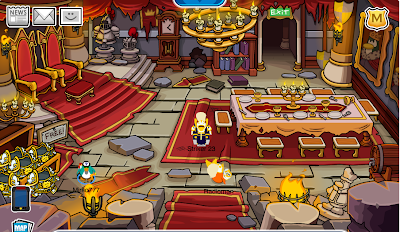 Club Penguin Cheats by Mimo777 Club Penguin Cheats by Mimo777: Club Penguin Medieval Party Ye Knights Quest #3 Cheats 2011! Club Penguin Medieval Party Ye Knights Quest #3 Cheats 2011! Club Penguin Medieval Party Members Ye Knights Quest #3 Cheats 2011! 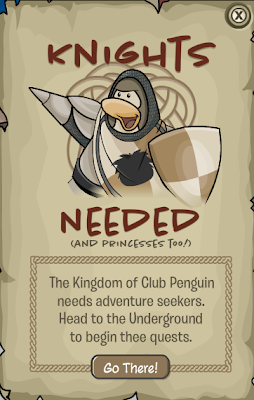 CLUB PENGUIN MEDIEVAL MEMBER QUEST CHEAT ALERT! Here are the walk-thru cheats for the Members Only area and free items Cheats for YE KNIGHTS QUEST #3! Step 1. Go to the Plaza and down the manhole. Or, there is a poster. Now click on "Go There!" The first challenge you have to watch the balls and pick the correct color. Do this 3 times! Don't forget to pick up the cool FREE item! 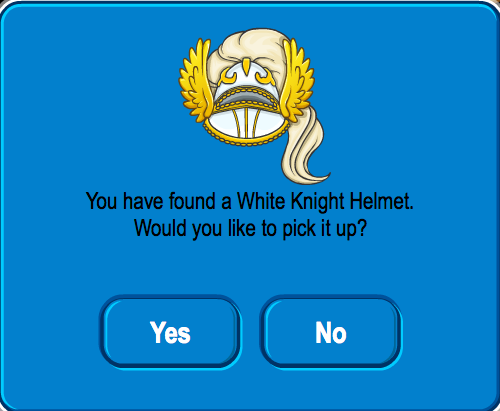 You now have the White Knight Helmet! Challenge 2, walk up to each platform and a button will pop up. The button will open or close the gate around all the platforms. Step 1. Press the red button. Step 2. 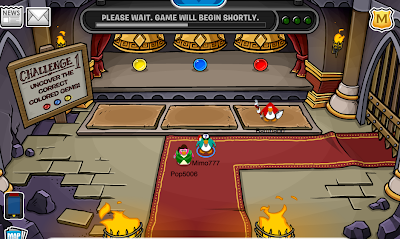 Walk to the blue button and press it. Step 3. Walk back to the red button and press it. Step 4. 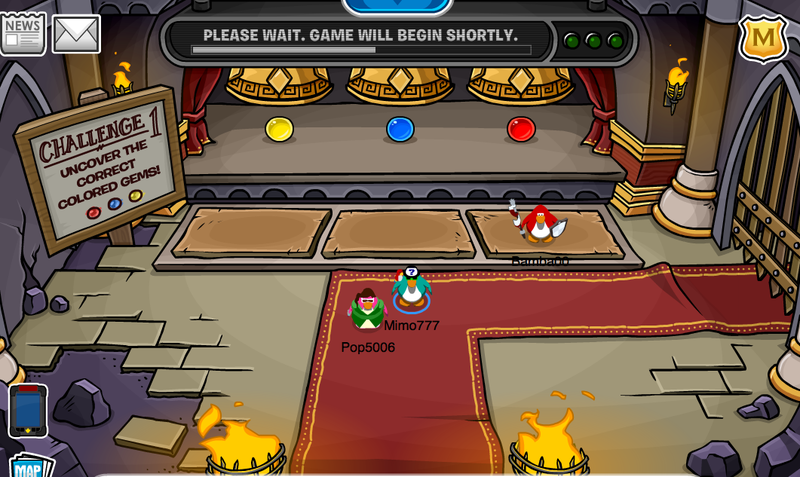 Walk to the yellow button and press it. Step 5. Walk past the green button to the other side. 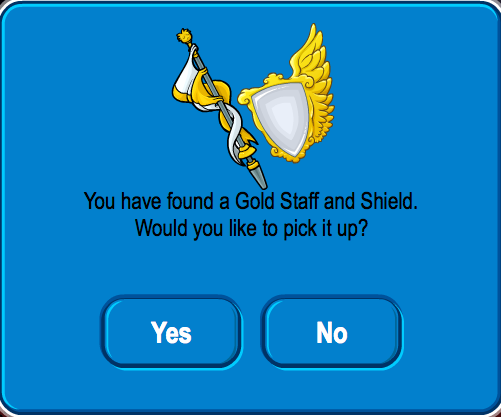 You now have the Gold Staff and Shield! You will NEED these items! Put them on NOW! Pay attention to the signs. They show you how to defeat the Dragons! Yikes! 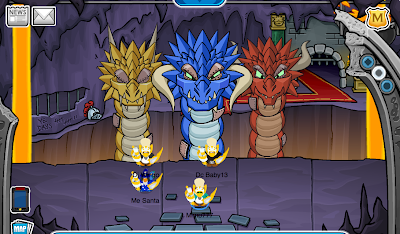 Check out these are scary Dragons! You will need to work fast to defeat these dragons. Be careful, they can regenerate their lives! With the Shield and Sword stand on the area that lights up. You will reflect its flames with your shield. Throw snowball in its mouth before it shoots flames at you. Throw snowballs into the pot filled with lava. You will need to time this just right to get it to spill on its head. Be careful not to let him freeze you! YOU"VE MADE IT! 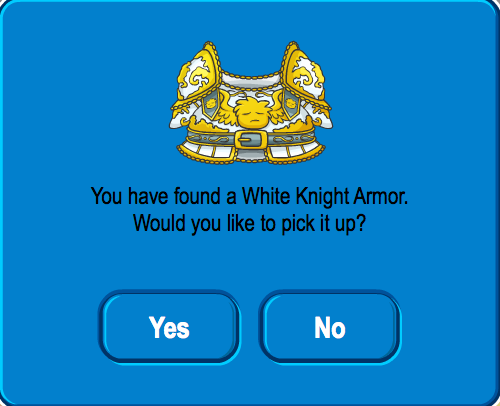 You can now get the last super cool free item cheat - White Knights Armor! It still doesn't work for me. 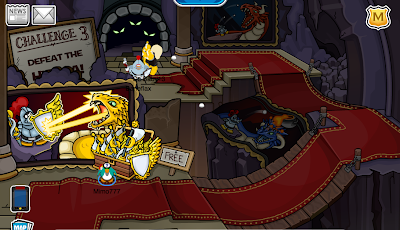 Somebody said that they got their stuff from the Spanish servers, so I tried it and it worked there! Seemed like everything was okay on those servers...why is that? you can no longer pick up the medival shield pin it says " This item is not currently available "
I cannot complete the 2nd challenge. Help please! Challenge #3 works for me until the hydra room, nothing loads, it's penguins on blank background. No music or sounds either. I'm pretty sure it's CP's fault, not my computer, though. Mimo, not being rude but I would like to point out that it is not a dragon but a Hydra. A Hydra is a Greek Monster/Myth that had nine heads and was poisonous. In CP, they simplified it to just three. Every time one head was injured it would grow another. This is simalar to how the Hydra in CP would regenerate. Thanks. Always trying to help. There a purple wizard hat at the lighthouse! You see when I played the dragon thing in quest 3 is did it. Then I wanted to do it again but the rock bridge didn't come up! On the same day my friends came over and they had done it! Then guess what. They had the rock bridge! Is this a glitch? Can you help me? Thanks! 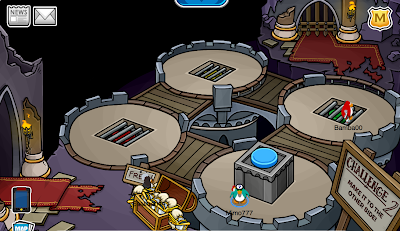 Dont forget the wizards hat in the lighthouse, and the pin making machine in the boiler room (new brazier pin). You missed a few things mimmo there's a wizard hat in the lighthouse, and there is a pin making machine in the boiler room. There might be more but you see I am only a non member my parents won't let me become a member. The armor gives you a new dance i checked a penguin in club penguin it will make have a flag! I keep freezing when I go into the gift shop.